Volleyball Coach Mike Jordan Picks up 350th Win! LAS CRUCES, N.M. – The New Mexico State volleyball team swept Utah Valley (25-18, 25-18, 25-20) in the Pan American Center, Thursday, Nov. 21 to finish the regular season 20-10 overall and 14-2 in Western Athletic Conference play. Utah Valley falls to 18-14 overall and 11-5 in WAC play. With the 20th win on the year, head coach Mike Jordan now has a total of 10, 20-win seasons under his belt and now has 350 wins during his career at NM State. The Aggie defense held UVU to a .021 hitting percentage while the offense posted more kills 38-29. Senior Desiree Scott and redshirt sophomore Gwen Murphy tallied a team-high nine kills while senior Preslie Alexander tallied seven kills. The ball was spread around offensively as senior setter Ciara Brown tallied a team-high 18 assists and sophomore setter Taylor Livoti marked 13. Defensively, the Aggies out-blocked the Wolverines 12-5 with Scott posting five total blocks, two solo and three assisted. Murphy was also in on five blocks with one solo and four assisted. NM State used two separate three-point rallies to take an early 10-5 lead during set number one. The Wolverines would counter with a three-point rally of their own midway through the set to cut the Aggie lead to 12-9. NM State would proceed to mark nine of the next 14 points, however, to take control of the set. The run was capped off by two kills by senior Preslie Alexander. Fittingly, another senior, Scott, had the final kill of the set to give the set to NM State, 25-18. Scott led the Aggies with three kills in the set. NM State finished set one with a .276 hitting percentage while the conference leaders in opponent’s hitting percentage held Utah Valley to a .000 percentage after the Wolverines had 11 kills and 11 attacking errors. As in set one, the Aggies scored three-consecutive points early to take an early advantage. It was a good thing, as neither team would mark more than two-consecutive for the rest of the set until late in the set. NM State maintained a slim lead throughout with both teams trading points. Scott kept the Aggies in front by marking four-straight points for NM State. Her final kill of the set gave the Aggies a 20-16 lead. NM State would go on to mark five of the final six points of the set to win, 25-18, and take a 2-0 advantage. Scott once again led the Aggies in kills, finishing with five in the set. NM State improved its hitting percentage to .361 in set two, marking 17 total kills while only committing four attack errors. For the first time in the match, Utah Valley jumped ahead of the Aggies in set three. The Wolverines used a two and three-point rally to take an early 6-3 lead. NM State did not flinch, as it would mark eight of the next 12 points to take its first lead of the set at 11-10. A match-high seven-point rally midway through the set gave the Aggies a commanding 18-12 lead that Utah Valley could not overcome. A kill and solo block by Murphy put NM State one point away from victory. A short rally by Utah Valley was upended by a kill by senior Stephanie Ziegler to give the set and match to the Aggies. The Aggies now head into the Western Athletic Conference tournament in Phoenix, Ariz., which starts, Monday, Nov. 25. 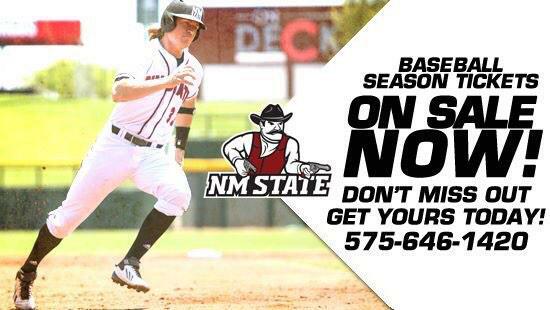 A complete preview of the tournament will be posted online at www.NMStateSports.com.